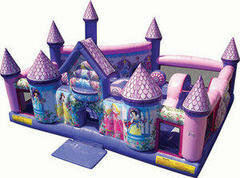 This Beautiful Disney Princess Palace inflatable toddler unit is filled with great activities for your toddlers. It has a small obstacle area, a 3 foot slide, a ball pit area (we do not provide balls) and a jumping area. The Disney Princess Palace ifun jump has educational games which will stimulate the minds for your tots. Name the Disney princesses: Cinderella, Jasmine, Belle, Sleeping Beauty, Snow White, learn to count by matching the quantity of gems, various gem patterns that the toddlers will have to match (like a puzzle).The Disney Princess Palace fun jump is available for rent Lafayette and surrounding area..